What is your greatest pleasure? This was the question we were asked as we stood in a circle around an altar traditionally used to facilitate indigenous religious ceremonies. There were nearly 70 of us in the room representing ESPERA groups from El Salvador, Guatemala, Honduras, Mexico, Nicaragua and the Mary’s Pence staff and board. We were gathered in La Palma, El Salvador to celebrate and begin an evaluation of the ESPERA program after a decade of work. A few days later, the hard work we had come to do now over, we were asked another question: how is your heart? This question was posed to our group by Sister Peggy O’Neill, a sister of Charity who has spent the majority of her life in El Salvador and knows well the context of our work, historic and current. This is a time of celebration for Mary’s Pence. But it is also a time of asking questions – the right questions. 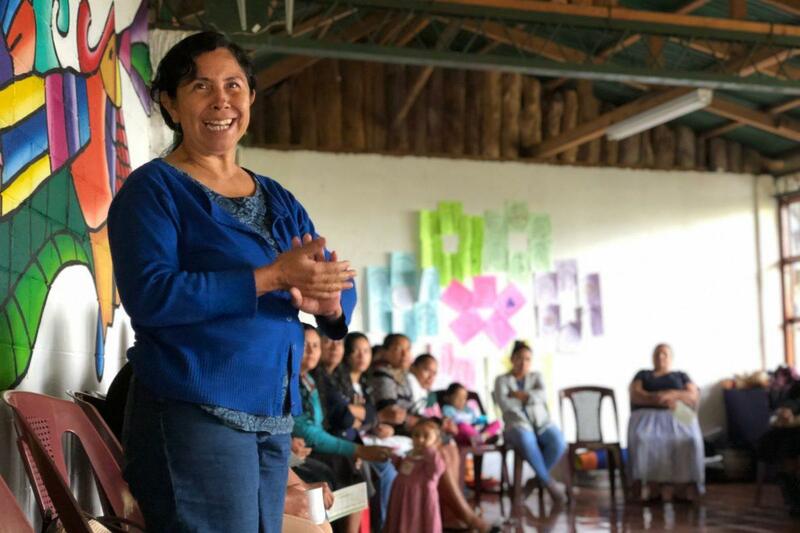 It is with keen attention to context and, as always, with the priority of listening to and learning from the women who participate, that Mary’s Pence is now in the process of evaluating the ESPERA program. Mary’s Pence has hired two women evaluators who are native Spanish-speakers and who have each lived in El Salvador for over 10 years. These women facilitated the encuentro gathering in La Palma and have worked closely with Mary’s Pence and regional ESPERA staff to develop an evaluation plan, which is now underway. If we used just one word to describe the experience of the encuentro, it would have to be gratitude. All throughout the days we spent together, women expressed gratitude for the opportunity to participate in the ESPERA program and the opportunity to meet one another, for the work of Mary’s Pence and the work of our ancestors. We look forward to the opportunity to share more about the encuentro and the evaluation with you throughout the spring and summer. But for now, we would like to take this moment to express our deep gratitude for you, our supporters, who make ESPERA possible.